Walsall Co-op…..what was your divi’ number? This popular photograph shows the milkmen of the Co-op posing with their trusty steeds outside the main offices and store in Upper Bridge Street in the 1930s. The familiar stub from the Walsall & District Co-op. Not one of my Mom’s sadly, you could get some divi’ off 57 quid! Apologies to any reader who thinks this post is going to be a history of the Co-operative Society in Walsall, sorry to disappoint, but is not, merely observations accompanied by some of my photographs. As a lad growing up in the 1950s one number I never forgot, apart from our house number, was Mom’s Co-op divi’ number….12530. It’s still embedded in my brain today, no prompting required! My local branch was a grocery store on the corner of Sandwell Street and West Bromwich Street and I was in and out of there like a ferret down a hole doing errands for the older women who lived by us. Mrs Tombs was one, she lived to be about a 102 if I remember correctly, a grand old lady who always had a good tale to tell, another was Mrs Lockley from 228, Mrs Clayton of 224, my gran at 226, Dora Johnson who lived with her brother and dad at 222, Mrs Lewis, a widow at 218 and two sisters who lived at 216, Miss Stokes and Mrs Wynne. The latter pair were daughters of Alfred Stokes who was captain of Walsall Swifts football club and forerunners, along with Walsall Town, of Walsall FC, proudly known as the Saddlers. I’ve done some miles on my Gresham Flyer, a three-wheeler bike, whizzing up and down Sandwell Street fetching groceries for the ladies mentioned for a tanner a time. Our local Co-op always had their black delivery bike with a large basket up front parked in the entrance of the shop, ridden not by Granville but a chap named Graham I think. Another thing the Co-op was really good for were combustibles in the shape of cardboard boxes, ideal when bonfire night came around in November! 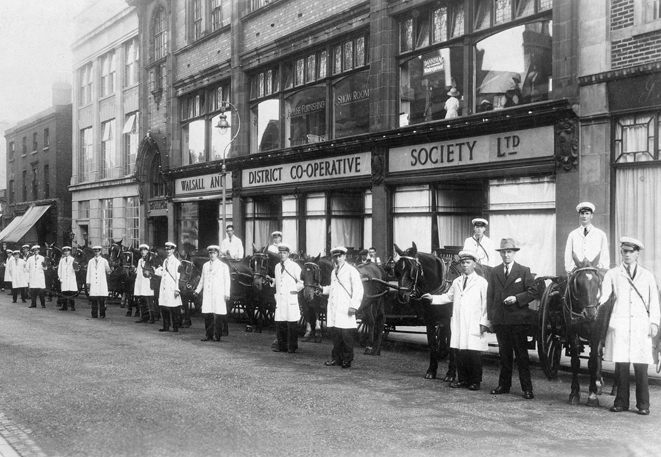 The origins of the Co-operative Society in Walsall go back to 1829 but it was not until 1886 the first branch opened after several failed attempts. 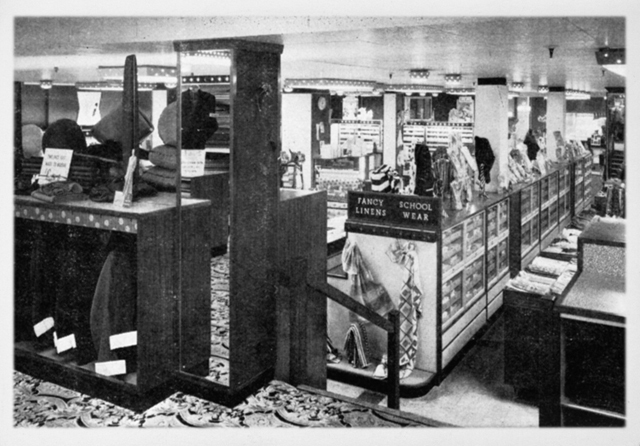 The first shop opened in Hatherton Street and moved to 226 Stafford Street after just six months of trading. Progress was slow initially and after five years the Society still only had around one hundred and fifty members. In the early 1890s the Society moved a little further up Stafford Street to number 243. The survival in those early days was down to the perseverance and generosity of the treasurer, George Harrison. At times the Society was heavily in debt to him personally. Around the turn of the century the Society dropped the word ‘new’ from its title and for the first time steady growth occurred. Over the coming years many branches were opened all over the town and its outlying districts. In 1928 the Society’s premises in Upper Bridge Street were improved and extended over a six-year period, the work being completed in 1934. 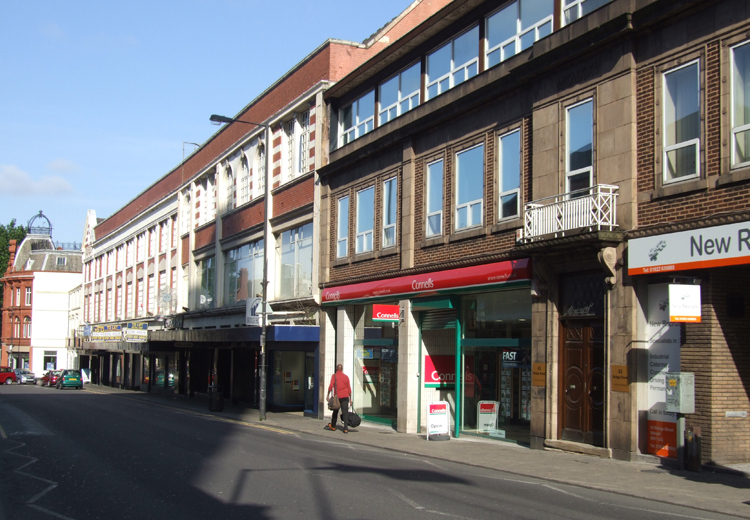 In 1988 the Society vacated the premises in Upper Bridge Street re-locating to the Quasar Centre in Park Street. 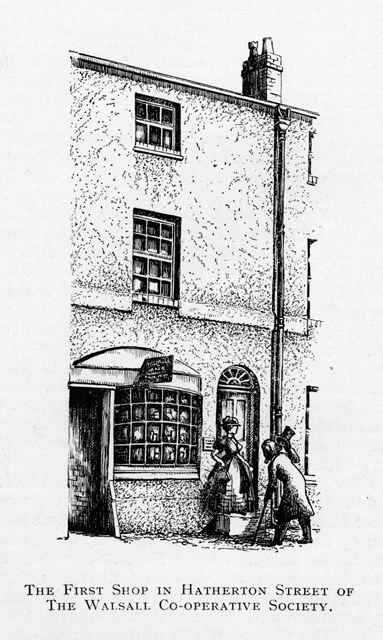 A drawing by George Willott, Principal of Walsall Art School showing the first Co-op premises in Hatherton Street. 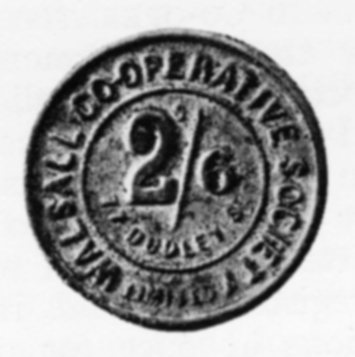 An early Walsall Co-operative Society check. The old Co-op buildings prior to demolition to make way for the new store. 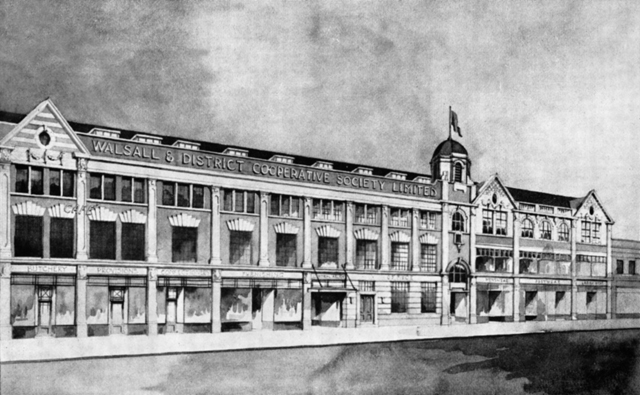 An architects illustration of the new store in Upper Bridge Street premises completed in 1936. 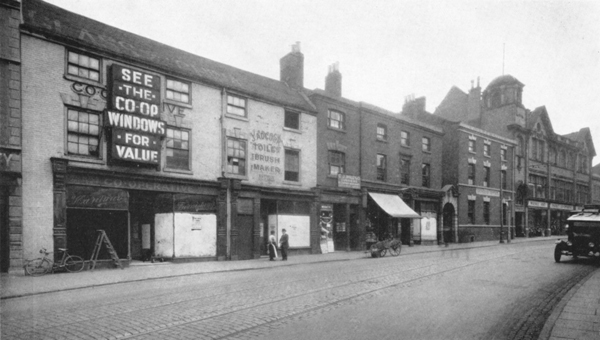 The mid-thirties was a time of growth for the Walsall Society, as well as upgrading the Upper Bridge Street store a new dairy was opened in Midland Road in 1937. Previously the dairy had been housed in premises behind the main store in Bridge Street. 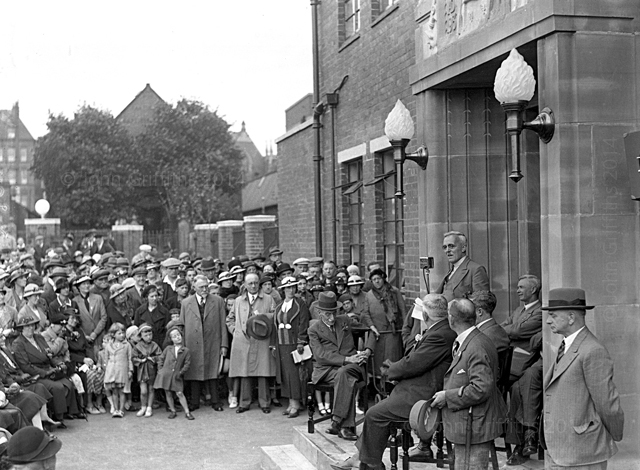 An official opening ceremony of the new dairy took place on the 10th July 1937 with Mr C. W. Dewsbury, J.P. of the Building Committee officiating. The building was constructed by Deacon and Boardman of Algernon Street at a cost of £60,000. Over five hundred members attended the opening ceremony and the picture below shows Society President, Thomas Gwinnett addressing the gathering. In the background of the picture are three buildings familiar to generations of Walsall people: in the top left corner the old Out-Patients Department and Nurses Home of the now demolished General Hospital can be seen, in the opposite corner is the Congregational Church, also on Wednesbury Road. In the middle of the picture, behind the trees, is the roof of the Particular Baptist Chapel which is opposite the dairy. Thomas Gwinnett, President of Walsall Co-operative Society addressing members at the opening of the new dairy. 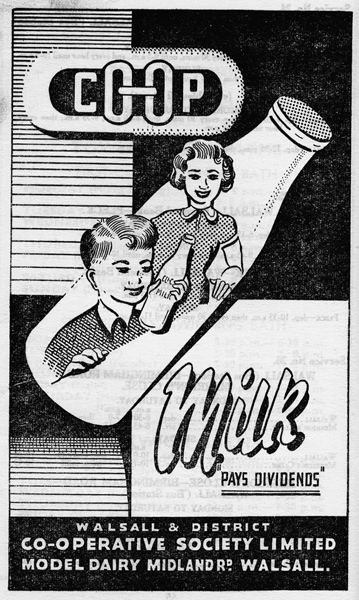 An advertisement for the newly opened dairy. 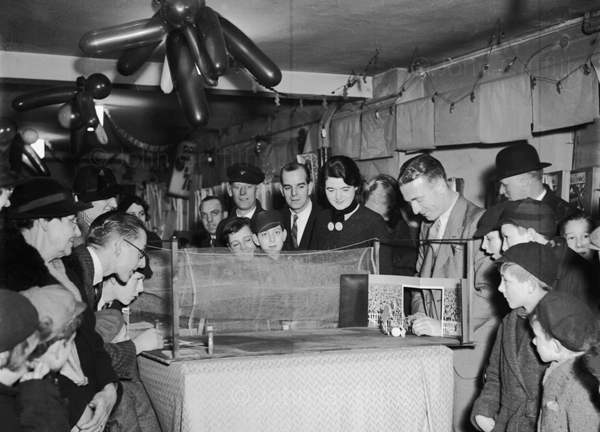 Harry Hibbs demonstrating a football game, he is the one on the right with his hand in the goal. The management of the new store were always aware of a chance to promote the Co-op and in December 1936 Harry Hibbs the Birmingham City and England goalkeeper was invited to Upper Bridge Street to promote a football game. Harry was born in Tamworth in 1906 and after retiring from playing he became manager of the Saddlers from 1944 until 1951. Going back to school in September always began with a trip to the Co-op, (or Buxton and Bonnets), in late August to get kitted out for the new school year, if you were lucky. In 2014 one hears people asking “what did we do before supermarkets?”, the simple answer is we went to the Co-op! Literally from cradle to the grave, you could get everything at the Co-op, the Rochdale Pioneers should be proud of that fact. 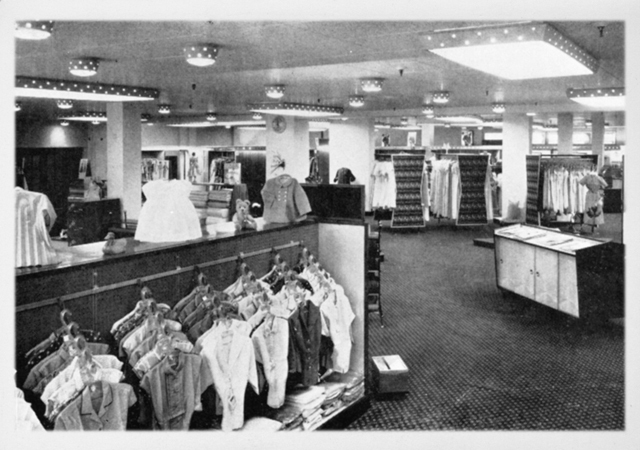 The departments within the Co-op seemed endless, grocery, drapery, furnishing, electricals, footwear, butchery, bakery, coal, travel, floristry…..even holidays and coach travel with Central Coaches. One of the great things about the internet is the ability to alter content on websites in seconds. After publishing this post on Wednesday a friend of mine, Peter Wilkes, sent me a message pointing out I had forgotten to mention the ladies and gents hairdressing departments. I confessed I wasn’t aware the Co-op had hairdressers but on very close examination of From Acorn to Oak book there is one small entry confirming the fact so thanks Peter for making me aware of the fact. Apparently the ladies department was in the basement with the gents on the ground floor. Peter tells me he worked there as a 18 year-old and I gather from his tone, it wasn’t the happiest time of his life! The branch managers from Walsall & District Co-op on a visit to the C.W.S. factories at Lowestoft, Suffolk on the 16th June 1936. I can only identify one of these managers and that is the big man seated in the centre, George Wimlett, the Grocery Dept. manager. Although the Bridge Street store is long gone many people in the town still refer to the Kenmare Restaurant with great affection. First opened in 1936 as the Kenmare Cafe with a Miss C. Hobbs in charge. During the war years the manageress was a Miss Williams, she resigned in 1945 and the first-class cook under her, Mrs E. Pidgeon became manageress. With supplies difficult to obtain during the war years many people took meals out to augment their small rations. The Cafe, as it was still called then, was always filled at lunchtime and very often at tea time too. When food rationing ceased the name change to the Kenmare Restaurant and still the people came, continuing to fill the restaurant at lunch times and when a special occasions occurred the staff had to turn customers away. Market days were particularly busy with the restaurant being filled to capacity at tea time. Mrs Pidgeon’s appointment proved to be a great asset as she developed trade considerably catering for functions of all descriptions. From the early days when just eleven staff were employed this had grown by 1960 to twenty-nine. 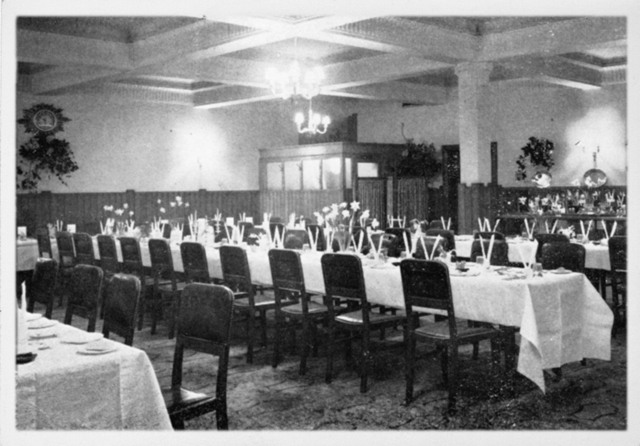 The Old Blues Association from Blue Coat School regularly held their annual dinner there as did many other associations around the town sometimes having to book over a year in advance. There must be many married couples living in Walsall today that can remember with affection their wedding day reception at the Kenmare Restaurant. The Kenmare Restaurant circa 1960. Prices and menus for the Kenmare Restaurant, circa 1965. As early as 1929 the Walsall Co-operative Society were holding conferences in the old premises. 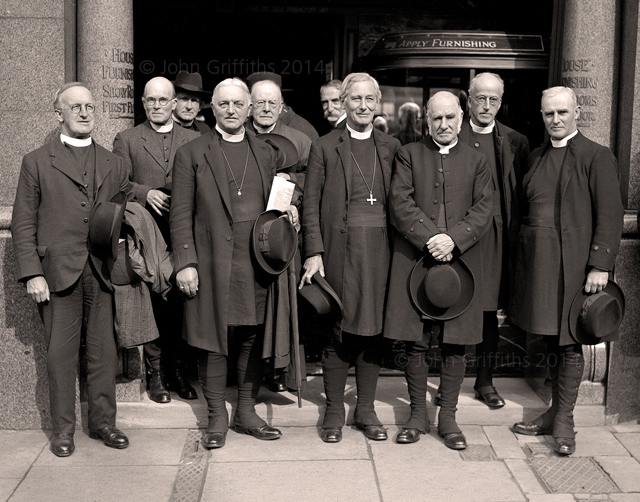 The picture below shows a group of senior clergymen who attended a Diocesan Conference in early October 1929. The Bishop of Lichfield, Dr. J. A. Kempthorne is in the middle surrounded by the Bishop of Stafford and the Archdeacons of Stoke, Stafford and Salop. Looking at this picture one is immediately reminded of 1966 television series, All Gas and Gaiters starring the late Derek Nimmo which was a comedy programme, but looking at the real thing they all appear to be somewhat devoid of humour. 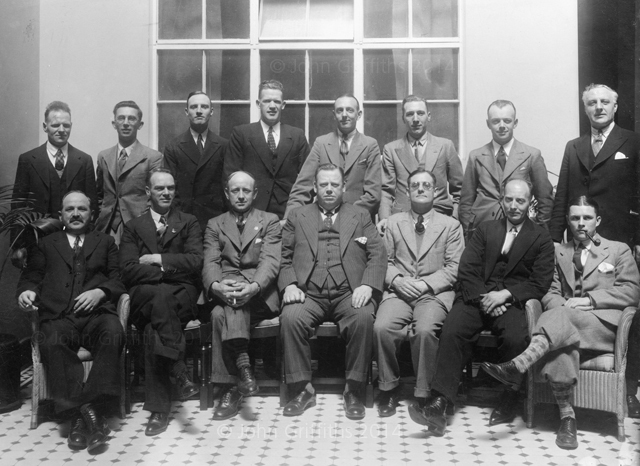 Members of the Diocesan Conference held at the Co-op in October 1929. Finally, one other great institution upheld by the Co-op was making sure Father Christmas appeared annually in his grotto in Upper Bridge Street to please the youngsters in the town from mid November through to Christmas Eve. Although I have no pictures of Santa in all his glory in his grotto I do have one of him relaxing on his holidays with his family. From 1956 until 1965 retired engineer Edward Berwick of West Bromwich Road took on the mantle of Father Christmas, dishing out presents and happiness to the hundreds of kids that passed through his grotto. Certainly when I went there at the tender of age of 17 or so, I jest……….little did I know I was talking to the grandfather of my future wife, Margaret! Father Christmas pictured with his family! 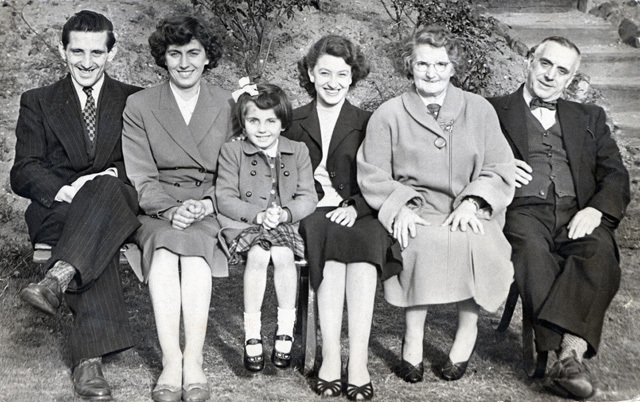 From left to right, son Graham and his wife Winnie (neé Jukes) and daughter Margaret, a family friend, wife Sarah (neé Gough) and Edward himself. A gap of around seventy-eight years separates the two photographs that open and close this post. You are currently reading Walsall Co-op…..what was your divi’ number? at Walsall Life.